9x12 watercolor. When I saw this prompt, my mind went back to my childhood and a walk down a fall colored driveway covered with leaves. 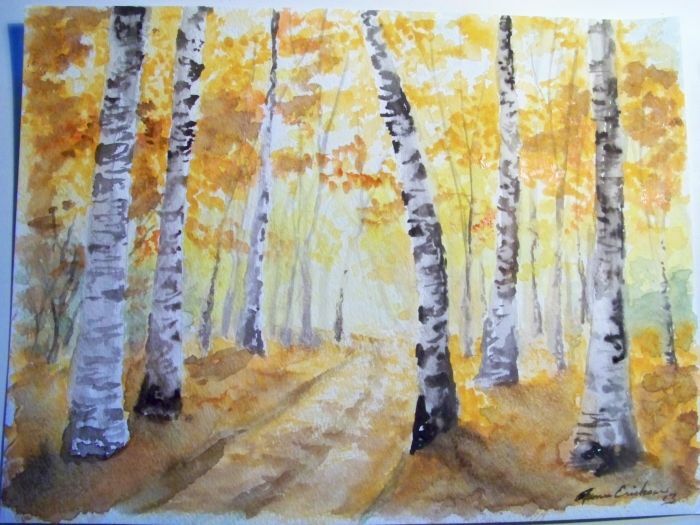 Birch trees in their full glory with the sun streaming threw. katerina Koukiotis says: beautiful !! ~ Reply? Ellen Million says: Oh, this is GORGEOUS! One of my favorite sights. ~ Reply? Jenny Heidewald says: Katerina and Ellen stole my first two words... I have to say again I just love your use of color to portray light in your paintings, just lovely! ~ Reply? Erich Heidewald says: I love dramatic golden light. I sooooo want to walk down that drive to see where it goes! ~ Reply? Renee Erickson replied to this: Thank you Erich--The walk down this drive, would of taken you to a little lake. mikka says: Oooh. Yes, please, I want to visit. ~ Reply?